Based in Austin, Texas, Naturopathic Doctor Amy Neuzil specializes in weight loss, woman's health and mental disorders. She has frequent radio appearances and appeared on the TV series "The Genesis of Healing." She has been consulted for "Natural Health Magazine" and "Health Talk." Her first book, "DIY Health: For Women" was published in 2009. Pregnancy is a unique situation in life that forces you to go back through your daily routine and rethink not only what is good for you, but also what is good for your baby. 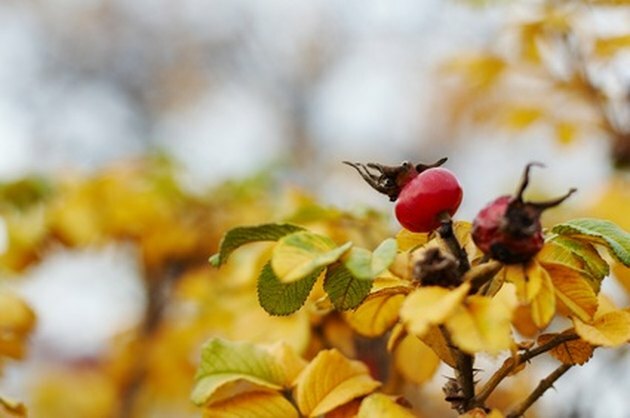 Rose hips and rose hip tea are commonly used products, but many women hesitate to use anything herbal during pregnancy. According to Baby Center, rose hip tea is safe to consume during pregnancy and so it is important to know what the effects of rose hips are on you and your baby. Vitamin C is essential during pregnancy because it is absolutely necessary for collagen formation in both you and your baby. Childbirth Solutions lists rose hips as one of the most effective herbal sources of vitamin C for pregnant women along with a number of food sources such as cabbage, papaya, guava and cantaloupe. Vitamin C also helps your iron and calcium absorption, and both of those minerals are vital for baby's development. According to Bright Hub, rose hips also contain vitamin E, selenium, manganese, B complex vitamins, magnesium and potassium. All of these elements together make rose hips an effective boost to your immune system to help protect both you and your baby. Combine those vitamins and minerals with the vitamin C content and rose hips really pack a punch against colds, flus and other bugs. Vitamin A is most commonly found in orange and yellow fruits and vegetables, the carotenoid content is actually the pigment that gives those fruits and veggies their color. The same is true with rose hips which contain both vitamin A in it's true form, and also mixed carotenoids, which are precursors to vitamin A in our bodies. True to form, rose hips are also orange to red in color. Bright Hub claims that rose hips have mild astringent and diuretic properties which can be extremely helpful in pregnancy. This can help with chronic kidney disease or poor bladder control, which becomes more common as pregnancy advances into the third trimester. Fruit acids and pectin from the rose hips also act as a mild laxative to soften and ease your bowel movements. Is Cranberry Juice Safe to Drink While Pregnant?